A retreat is an opportunity to replenish your energies and take your mindfulness practice further than you can in normal life. Melt away the November blues with peaceful meditations and soothing mindfulness. A lovely day of gentle practices to re-connect with your body and be more conscious. 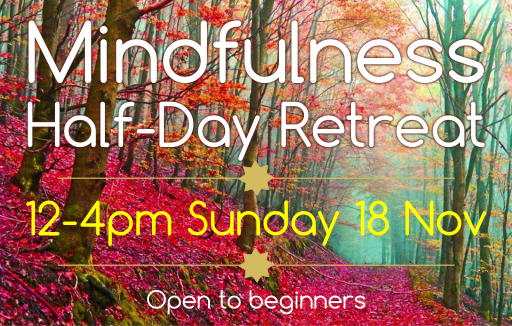 This Mindfulness Class & Retreat is a rest and recuperation time during this hectic month. It is also a chance to learn or rekindle one’s interest in Mindfulness. 11am-1pm The Community Centre Cafe & Craft Market is on that day so come early and have a cuppa and check out the crafts by local people. Although the community centre is generally nice and warm, you may still want to bring a blanket and warm clothes. This is a mini retreat with Colin Ellis, an established meditation and mindfulness teacher. Here is a poster (pdf). If you can put it up somewhere or hand it to friends, that would be great! 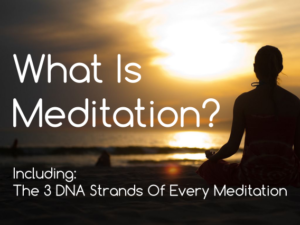 If new (or not so new) to meditation or mindfulness I suggest you join my online mini-course on “What Is Meditation?”, where I go through the 4 DNA Strands of every meditation – check it out – it’s a lot more useful than it sounds :-) BTW, it is only FREE via this link for a limited time.